Panoramic Fiordland Views from sunny warm rooms. 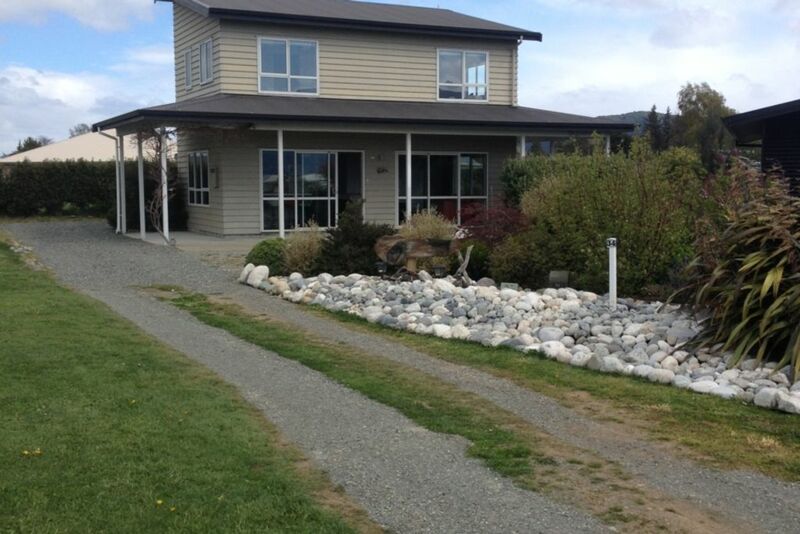 Come and enjoy what Te Anau has to offer, peace and quiet, grand mountain views and beautiful bush walks. Day and overnight boat trips in stunning mountain and bush terrain. The Glow worm cave trip is excellent for everyone in the family. Thrills can still be found blasting down the Waiau River where some of the Peter Jackson Lord of the Rings film was made. A challenging 18 hole golf course awaits and the tennis club is gaining international recognition. Our stunning holiday home is only a short walk to the lake front, restaurants and 3 world class walking tracks but far enough away from any traffic to feel lost in the views. Backing onto a reserve there is plenty of space for children to play. The indoor outdoor flow makes this home easy living, you stay sheltered from the elements at all time and can still absorb the view. The table tennis room is proving very popular with all ages and is a welcome activity if the weather has turned ! But even then the moody backdrop of the mountains is awesome ! We have put in a small sandpit to keep the toddlers amused ! There are 3 queen sized beds and two king singles in one bedroom which are also suitable for adults . We do have a 3 bedroom property at 27 Jackson street if you have a larger group looking for quality accomodation. Pets only with special arrangements. Gordon emigrated from the South of England UK in 1994. Viv is from Cheviot N. Canterbury NZ. We have two children Ellen 26 and Ben 22 both overseas currently ! As a family we have traveled to many places in the world and so we understand the rigors of travel and the requirements of a traveler ! Gordon is a dairy farm consultant based in Southland . We felt in touch with the bush on the mountains across Lake Te Anau and love the feel that Fiordland offers . panaoramic views from windows upstairs plus open view across reserve downstairs . heat pump. 2 moveable radiators. The house warms up very quickly on a sunny day due to a lot of windows and sunny location. top loader. we provide a small amount of washing powder and a dryer . if you need some more space there is the reserve but please respect the fact that it is a reserve !! Unlimited wifi . Code is in information folder on island bench . Freezer at top . Ice cube maker . Ground coffee is in a tight seal container in fridge. Plenty of plates /cutlery and pots and pans. Small Omlette pan. wok , frying pan , egg poacher , rice cooker . Its your house and all yours !! see photos ! Fabulous walks along lake close by. Appreciated Gordon’s help. Lovely property, clean and spaceous. Enjoyed staying there. We stayed for four nights and the house was more than adequate. The house was located in a quiet neighborhood and was a five minute drive (or fifteen minute walk) to the center of Te Anau. The bedrooms on the second floor had great views of the surrounding mountains and Lake Te Anau was visible from one of the bedrooms. The kitchen was nicely stocked (although a smaller frying pan would have been a great addition) and the living area was well furnished. The small backyard with picnic table was an added bonus. It must be noted that one of the bathrooms was on the first floor off the ping-pong room. This location was a little inconvenient for taking showers. Also, the upstairs bathroom was split between two unconnected rooms - toilet in one room and sink/shower in the other room. But overall this house was a very good value. An enjoyable stay. Had fun playing table tennis!